The wedding was a roaring success. The ceremony was beautiful, dignified, and the reception was lively and will generate many stories in the years to come. You now find yourself at the after party with the wedding party. The whole day has been stress free, as far as weddings go. However, that has all changed. Everyone around the table is getting up and saying a few words about the new couple. Your turn is quickly approaching and you’re not even thinking about what you’re going to say. You’re more concerned that everyone will notice your crooked teeth. You know you want to straighten them, but what are your options? Which one is the best for you? Your orthodontist in Parsippany from Rauchberg Dental Group lets you know the variety of ways they can help you. 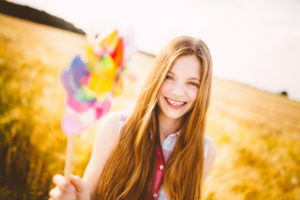 Long considered one of the most reliable orthodontic treatments available, traditional metal braces have been used to straighten people’s smiles for years. Just like they have for decades, metal braces still rely on a system of brackets and wires to slowly bring teeth into alignment. They are often the choice for children and teenagers because of their affordability and durability. They are also able to handle a wide variety of orthodontic issues, whether they are slight or severe. Treatment can last anywhere from 12-24 months and require periodic visits to the orthodontist to be adjusted. The only drawbacks metal braces have is that they can be irritating to the surrounding soft tissue, as well as have a noticeable effect on someone’s appearance. These braces work in the same fashion as metal braces with the only difference being the materials used to make them. Tooth-colored braces use clear ceramic brackets along with tooth-colored or clear wires to help lessen the appearance of the braces. This often makes them the choice for adults or older teenagers. Instead of brackets and wires, Invisalign uses a series of clear plastic aligner trays to help align teeth. The aligner trays, which slip on and off the teeth, are worn in a series to gradually straighten teeth over time. They have the advantage of being removable, making it easier for a patient to eat and clean their teeth as normal. They also have a minimal impact on someone’s appearance because the trays are almost invisible when worn. The trays also tend to be a bit easier on the lips and gums than traditional braces. However, they tend to be more expensive than traditional braces and cannot handle all orthodontic cases. Some of the least involved orthodontic treatments involve the use of retainers, expanders, and cribs. These can help assist other orthodontic treatments or stand on their own. They can address problems such as crowding or slightly misaligned teeth. Often after you have stopped wearing braces, a retainer is needed to help maintain the results. The only way to figure out the best method to straighten your teeth is by visiting us at Rauchberg Dental Group. That way we can assess your individual situation and see which solution best fits you. No matter which method we end up choosing, we know you will end up with a straighter smile that you can be proud of.